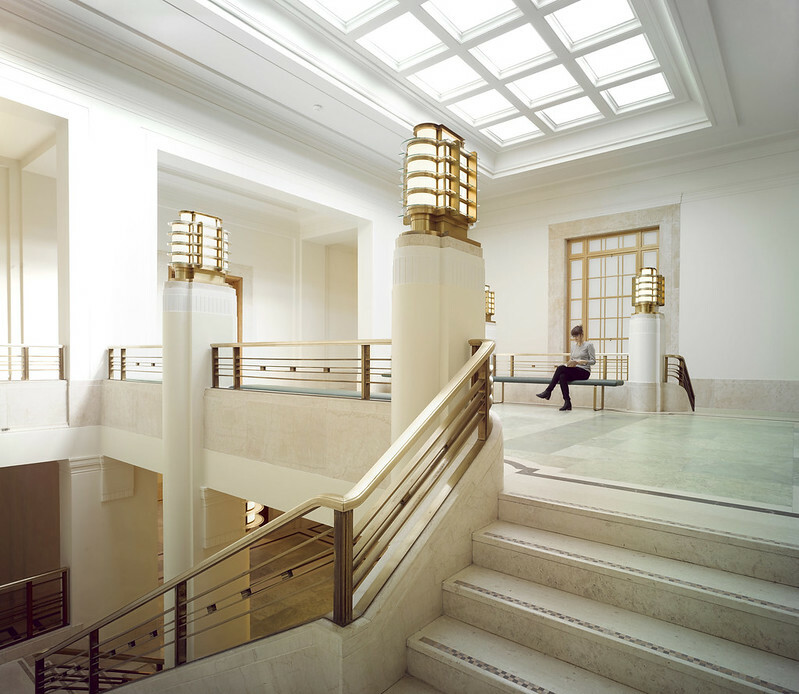 Comprehensive refurbishment of the Art Deco Grade II-listed Hackney Town Hall, encompassing painstaking restoration and the creation of 2 new indoor event spaces. After 80 years intensive use, the art deco Grade II listed Hackney Town Hall was in need of restoration and modernisation. In 2005 Hawkins\Brown was appointed by LB Hackney to carry out a complex series of works in overlapping phases linked to funding and allowing the town hall to remain open. The project represents a significant long term public investment and measures were taken to ensure the building provides value for money, increases efficiency, reduces waste and relative management costs. Over 12 years the building has been steadily transformed into a reborn centre for voting, business and community celebration. The works cover restoration, repair, reuse conservation, and conversion of the largely intact art deco building. Original timber panelling, marble floors, Crittall windows, chandeliers and furniture were painstakingly restored by a team of master craftspeople. New fittings and facilities, audio-visual equipment, blinds and light fittings were designed in the spirit of the art deco interiors, using matching materials and recognisable patterns and forms. 2 original unused central light wells are converted to indoor event spaces by the addition of ETFE roofs. Original ducts, corridors and service openings are reused wherever possible to bring new services and IT to every part of the building. Careful consideration has gone into every detail and, with the support of conservation bodies, all works reconcile the interests of conservation and access and the building now provides access for all and improved spatial efficiency. Underused space has been utilised and existing heritage rooms restored. This has resulted in increased occupancy, reduced energy and maintenance costs, better public facilities, new atria, event spaces, council services, and a more welcoming, bright and open reception. This project has delivered a town hall for Hackney that is once again a source of civic pride and a fine example of art deco architecture.